The driver was hurt in the crash but is expected to be okay. 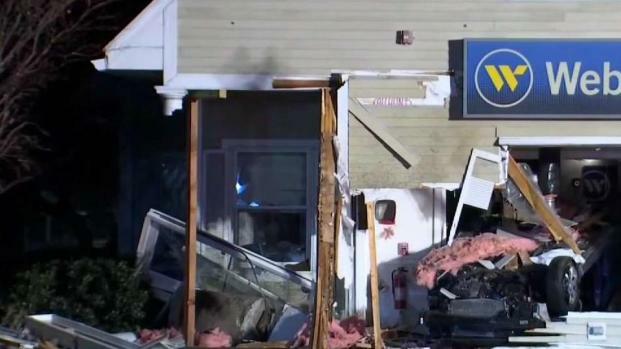 A man who had to be extricated from a car after crashing into a Massachusetts bank overnight will face several charges. Brockton authorities said the driver, identified as 51-year-old Robert Morano, will be charged with negligent operation of a motor vehicle, marked lanes violation, destruction of property, carrying a loaded firearm without a license, carrying a loaded firearm while intoxicated, and unlawful possession of ammunition. Morano was allegedly speeding in his Hyundai on Oak Street around 2:30 a.m. Friday when he appeared to lose control of his car and hit a curb leading into the parking lot of a CVS, according to Brockton police. The Hyundai went airborne and landed on the sidewalk leading to the entrance of a Webster Bank, taking out two handicapped parking signs and a light pole before crashing into the bank and flipping over on its roof, trapping Morano inside, police said. 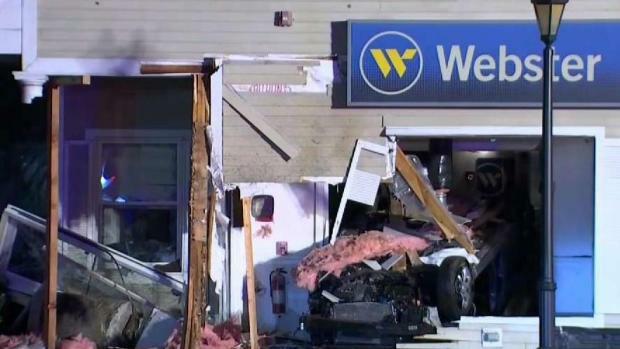 A man who crashed into a bank in Brockton, Massachusetts, is facing numerous charges including carrying a firearm while intoxicated. Police said officers arrived when the alarm went off. "They were notified by the alarm company that there was a car in the building," said Brockton Fire Captain Richard Costa. While firefighters worked to extricate Morano from the vehicle, authorities said the suspect told emergency workers that he had just left a bar. "The driver was alert when we arrived on scene, still located in the front seat of the vehicle," Costa said. Morano was taken by paramedics to Good Samaritan Hospital and eventually airlifted to Brigham & Women's Hospital in Boston. He remained hospitalized on Friday afternoon but his condition wasn't immediately clear. 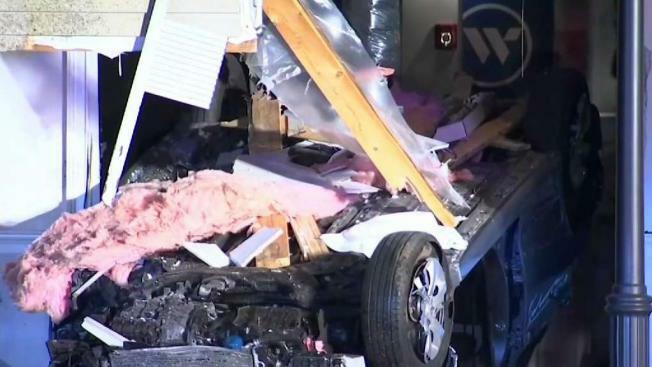 A man who had to be extricated from a car after crashing into a Brockton, Massachusetts bank overnight will face several charges. Police said the investigating officer recovered a loaded handgun from the scene. Morano's license to carry was expired. Authorities said they are waiting on medical records to determine whether additional charges are appropriate. It is not clear when Morano will be arraigned or if he has an attorney.